With the addition of 5,001 megawatts in the fourth quarter of 2015, total wind energy capacity in the U.S. is now just shy of 75 gigawatts, according to the latest market report from the American Wind Energy Association (AWEA). Last year, the U.S. installed 8,598 megawatts of wind power, up 77 percent over the 4,854 megawatts installed in 2014. The 5,001 megawatts added in fourth quarter of 2015 surpassed the entire previous year, and marked the second best quarter ever recorded. Overall, there are now 74,472 megawatts of installed wind capacity in the U.S., up from 16,702 megawatts at the beginning of 2008. Meanwhile, wind costs have dropped 66 percent over the past six years. But while the industry hit some major milestones, 2015 was still only the third-best year for wind power capacity after 2012 and 2009, which is a reflection of ongoing policy uncertainty. However, the wind industry expects to see strong and steady growth going forward thanks to the recent five-year extension of the Production Tax Credit (PTC), and growing demand for renewable energy to help states comply with the EPA Clean Power Plan, AWEA leaders said on a call with reporters yesterday. “The time has never been better for states and utilities to lock in low-cost, stably priced wind energy to achieve their Clean Power Plan carbon reductions,” said Tom Kiernan, CEO of AWEA. According to the trade group, wind energy currently provides about 4.5 percent of U.S. electricity. Kiernan believes wind is on track to supply 20 percent of the country’s electricity by 2030. Meanwhile, in Denmark, wind turbines provided 42 percent of the country’s electricity last year, marking a 3 percent increase over 2014 and setting a new world record. In the U.S., Texas continues to lead the market with 17,000 megawatts of installed wind capacity -- more than twice the amount of any other state. Iowa now ranks second, with more than 6,000 megawatts, and California ranks third with just under 6,000 megawatts. Oklahoma, which saw strong growth last year despite tax policy debates, is the fourth-largest market, with just over 5,000 megawatts. "Oklahoma has done a tremendous job of positioning the state as a competitive and attractive market for the wind industry to invest, and the benefits have been significant,” said Stephen Pike, vice president of operations and maintenance for Enel Green Power North America. 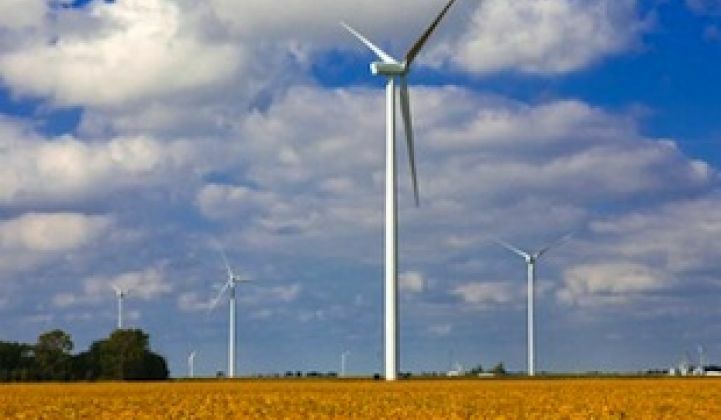 Wind is “a key pillar of economic development” in the state, especially in rural areas, he added. Last year also saw wind expand into new markets, with the first utility-scale wind project coming on-line in Connecticut, bringing the total number of states with wind projects to 40. Another trend in 2015 was the unprecedented adoption of long-term wind contracts among corporate and industrial customers. More than 1,800 megawatts of wind were obtained through PPAs signed in the fourth quarter of 2015, about 75 percent of which were signed by non-utility customers. Companies like buying wind PPAs because it helps them meet their environmental goals and cement brand leadership. But it also allows these big energy consumers to lock in their electricity costs for upward of a decade, avoiding potential price volatility, said John Powers, who leads the strategic renewables advisory division at Renewable Choice Energy. Commercial and industrial interest in wind really started to take off in 2014, with major growth starting in 2015. 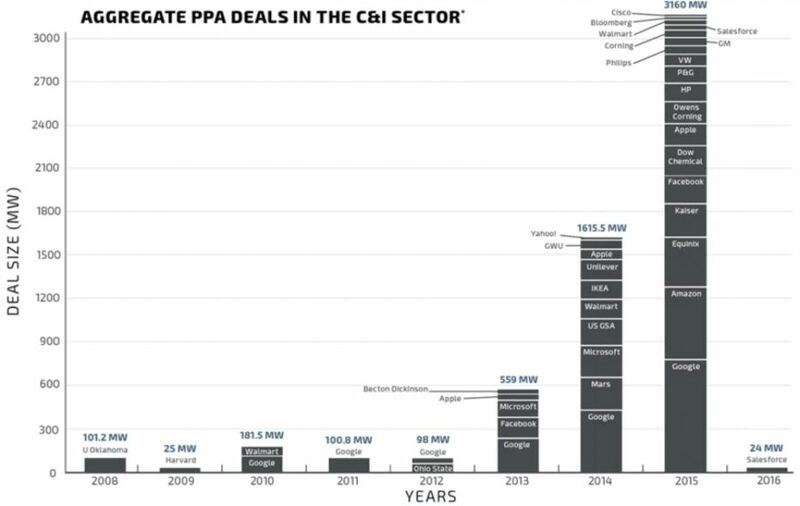 Amazon, for instance, signed four PPAs last year, its first four wind PPAs ever, and quickly surpassed Microsoft and Facebook to become the second-largest corporate PPA buyer in the country behind Google. According to Powers, aggregate wind PPA deals in the commercial and industrial sector totaled 3,160 megawatts in 2015. And there are already 24 megawatts on the books for 2016. 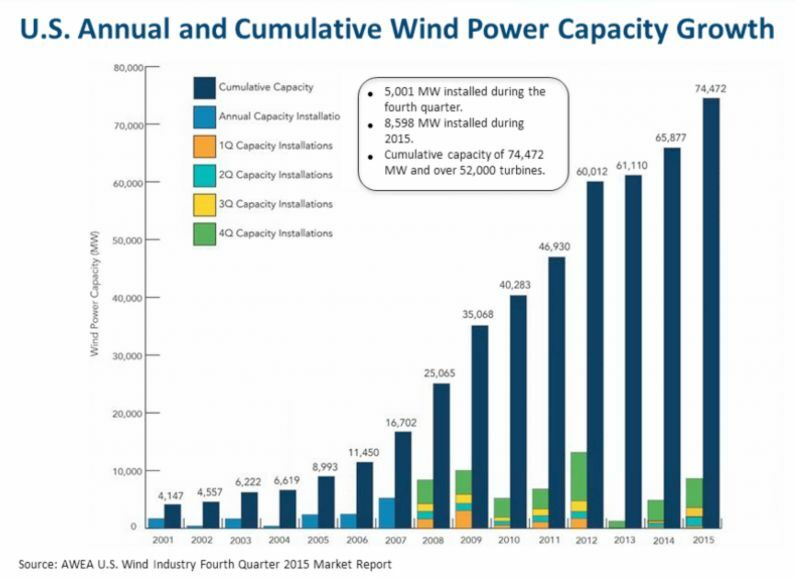 For the past several years, the U.S. wind sector has been growing in fits and starts. When the PTC expired in 2013, installations dropped by more than 90 percent that year, triggering the loss of 30,000 jobs. At the end of 2014, Congress passed a one-year retroactive extension of the PTC, with language that allowed projects to qualify for the credit as long as developers had started construction at some point during the year. This policy was the primary driver of wind capacity additions through 2015. Now, following the approval of a five-year PTC extension in December, there’s likely to be even greater wind industry growth this year. Through 2016, the PTC offers wind developers a credit of 2.3 cents per kilowatt-hour of electricity their projects generate. The incentive declines to 80 percent of its present value in 2017, 60 percent in 2018 and 40 percent in 2019. As in the past, wind projects qualify for the credit as long as developers have commenced construction before the end of the period, which effectively extends the PTC for another two years. The PTC extension doesn’t solve all of wind’s problems, however. “Having policy certainty with the tax credits in place overcomes one challenge, but others still exist, including availability of the necessary power lines, said Kiernan. Transmission lines serve as highways for renewable energy, and new lines will likely be necessary to meet Clean Power Plan requirements. But in many places, they also face pushback over their cost and appearance. AWEA maintains that new transmission lines provide a net benefit. A study published this week by the Southwest Power Pool, which supplies 14 states across the central U.S., found that power-line upgrades on its system between 2012 and 2014 saved $240 million in the first year of upgrades from fuel-cost savings alone.